Helen Williams is again this week's inspiration - she's created this really cute card purse that can contain 16 wee cards! You'll start realising I like people to share where they got their ideas from so the rest of us can go off & have a go! For the non-demos reading this her link to the card purse is a demonstrator only area on Split Coast Stampers - so you'll have to ask your demonstrator to share with you. Once again, thanks Helen, you so deserve your name Crafty Helen. So as the last challenge was so successful, I think this week's one is pretty obvious which is to create a wee card purse too. Random draw next Saturday night approx. 8.30pm again. Again you can link to Mr Linky using a public site like SCS or PCP if you don't have a blog. This week's prize will be some retired 6x6" Old Olive & Certainly Celery DSP. UPDATE: The winner using Random.org is no. 5 - congratulations Sally I'll be in touch. Hi all it's been a 3 day weekend in NZ (BLISS) so to finish the weekend off I thought I'd point out the cute video Jacque Pedersen has created on her blog on how to make a window frame - it's so easy. 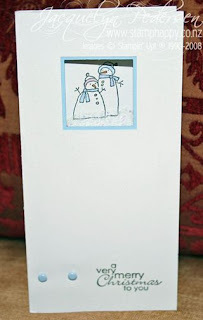 This would be a really cool Christmas card as it's quick and easy but has a bit of WOW & I love that CHUNKY glitter! Contact your demonstrator on how to earn the Window Dressing stamp set (which is a level 3 hostess set). 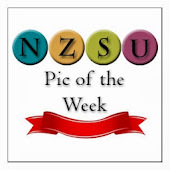 So how about the first NZSU blog challenge (since I've been one of the administrators)? 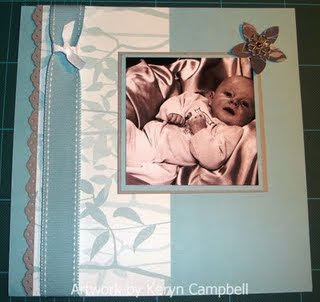 The challenge is to create a card using the window frame technique. I'll have a random draw this coming Saturday at approximately 8pm. The winner will receive a roll of Certainly Celery Twill & So Saffron grosgrain ribbon (~$35 value) from me. The winner was no. 7 congratulations Delys I'll be in touch. Happy crafting & I've changed the date (24 hours later) as so many cool cards & ideas & I want to enter too! Scrapbooking Inspiration : just case the catalogue! This week's inspirational blogger has to be Keryn Campbell who has promised to blog daily for a whole MONTH - well she is on target after a week As well as that she's on the Daring Card Makers challenge team - I'm not sure about daring maybe MAD maybe a better description but well done Keryn & keep up the good work. She's done some cool projects this week including cute paper bows but I just love her case straight from the Spring Mini catalogue of a scrapbook page - remember it's only 1 month to go for this Mini catalogue before the designer papers, stamps, ribbon etc will no longer be available. So contact your demonstrator sooner than later if there's something in there that catches your eye. The online Spring mini catalogue can be viewed HERE. For our kiwi readers - enjoy the long weekend & hope it's a crafty one! Hi all, as promised on my blurfing (blog surfing this last week) I found this cute Christmas ornament which I really loved, that Helen Williams from Timaru created - it may have something to do with the gorgeous DSP Ski Slope that's my favourite at the moment but I think I just love the gorgeous box she's created for it to go in. What a cool present would this be & dare I say it; it's now only 72 days to Christmas plus this DSP retires November 30 so don't be tardy - contact your demonstrator today to order some. You can check out Helen's post HERE with a link to how to create the ornament and to see her cute box. I'm sure most of you have already heard the tragic news about the discovery of little Aisling Symes. And I'm sure most of you, like myself have had their hearts touched and shed a tear. Take care, and give your children a big hug. Hi Trudi here, for the first time in a long time. Sorry for the absence - things have been busy as usual and then we had a family crisis to deal with, so now things are starting to come right. For the new demos who've emailed me to add their blogs, sorry for the delay, your blogs are now added to the blog roll. If I've missed you please email me your details and I'll add you ASAP. Hope you like the new look, its thanks to Karen Rogers, a wonderful lady who has come on board to help with running NZSU. She's still getting rid of a few kinks with some of the links so please be patient. I'm sure it'll be running smoothly soon enough. I hope you are all well, enjoying some peace and quiet for those with children who've returned to school. I'm in the process to putting the house back together. Hi and a quickie from Karen - don't tell me you hate the new look or I'll cry as it was a major job to re-add everyone to the links again. I'll try & post weekly inspiration from New Zealand & maybe it's time to start a few more challenges. If I've spelt your name wrong or you want the link to say something different e-mail me HERE & I'll fix it up ASAP.